It was May 18th 1980, and I just turned 6 years old. It was my birthday, but that's not the event I remember. Instead I vividly recall Mt. St. Helens erupting, dramatically launching billions of yards of ash into the air. A few days later this ash was falling in our yard 400 miles to the east in Montana. Dramatic events tend to be recorded in the mind like permanent signposts in life. Every time I look at this painting I immediately remember my 6th birthday, and the jar of ash we saved from that day. Memories can play an important role in the enjoyment of antiques. This ship portrait is of the British schooner "Homer, of Sunderland", entering the Bay of Naples, Italy in 1844. In the background you can see a lighthouse and the ominous rising plumes of Mt.Vesuvias. 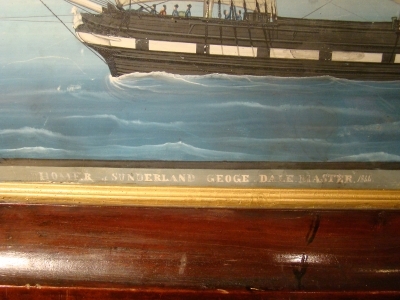 This gouache is titled 'Homer of Sunderland Geoge . Dale . Master . 1844'. From Vesuvius to Krakatoa, Mt St. Helens to the recent eruption of Iceland's Eyjafjallajokull, volcano's shape the land and impact our culture. The excavation of Herculaneum and Pompei sent ripples of renewed interest in classical antiquity throughout the world. This months Antiques and Fine Art magazine article on Frederic Edwin Church reminds me of the quiet influence volcano's impress upon the arts. The fiery sunsets of Church and William Ascroft owe some of their passion to volcanic ash in the upper atmosphere. In this painting the volcano is not the main subject, but serves as a subtle reminder that we play out our fragile lives on an unpredictable geological stage. How interesting your investigations are! I have a lot of interest in that English naval period.